We keep hearing from the media and OWS protestors that rising income inequality (or exploding income inequality according to Jonathan Chait) and stagnating household incomes have gotten worse in recent years, caused allegedly by the "rich getting richer at the expense of the poor and lower-income income groups" because disproportionate and rising shares of national income have been going to the top 1% or top 20%, etc. In other words, we're hearing the standard, typical "class warfare" narratives. Another part of that narrative is that income inequality wasn't nearly as much of a problem in the decades of the 1950s, 1960s, and 1970s when there was an upwardly mobile middle-class, when real median household income was rising year after year, and when income was more equitably and fairly distributed among income groups, i.e. during the "Golden Age" of the middle class. But once we experienced the Reagan tax cuts of the 1980s and the first "decade of greed," the American Dream of middle class equality started to fade. Once the Bush tax cuts of 2001 and 2003 took effect, the middle class was doomed, and "the rich" dominated the economy, upward mobility was over, the share of income going to the rich skyrocketed and income inequality "exploded." 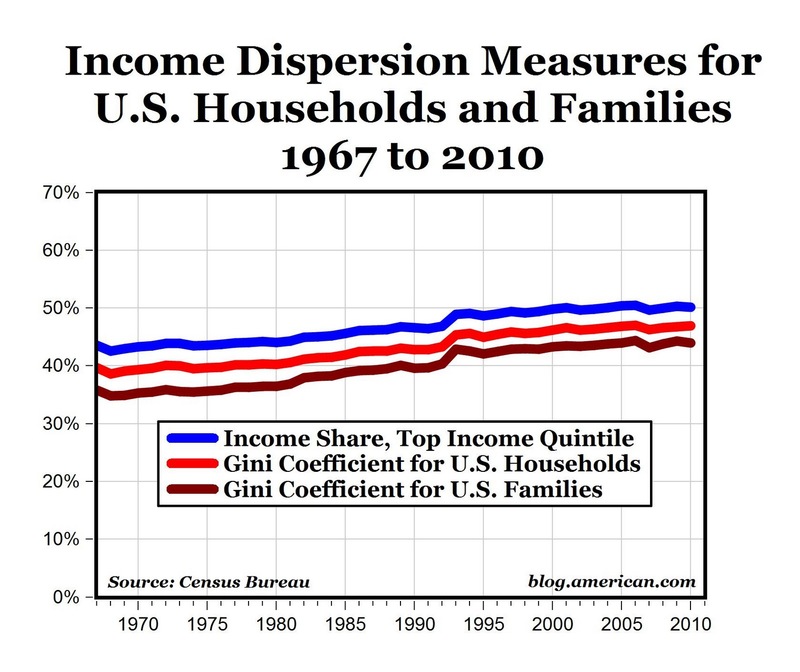 But there's a problem, because three different measures of income dispersion (the share of total U.S. income going to the top 20% of American households, and Gini coefficients for both U.S. households and families) from the Census Bureau (Tables E-1 and F-4) displayed in the two charts above show trends that are completely contrary to the common narrative. 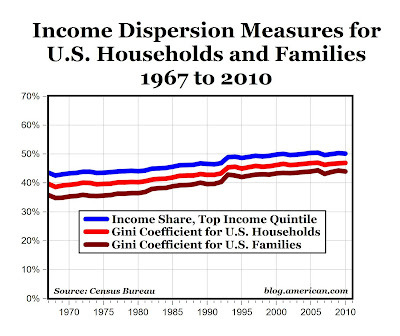 As can be seen in the top chart, all three measures of income dispersion have gradually increased over time, but most of the increases occurred in the earlier period between 1967 and 1994. Starting in the mid-1990s, the three measures of income inequality stalled out and barely changed in the sixteen years from 1994 to 2010 (see bottom chart of just the 1994-2010 period). Read more at The Enterprise Blog. Thanks to the Political Calculation blog posts here and here for the inspiration. The big difference is that now, people feel they deserve more. The 20-35 year old crowd, the ones mostly engaged in OWS, were raised by many to believe they should have everything. For the ones NOT raised that way, our efficient marketing machines have filled the gap. Not to sound old, but I was raised (and experienced) to understand if I wanted to get ahead, I'd have to work hard to get there. I'm just not seeing a lot of that drive in today's under 35 crowd and it's a shame. Maybe you don't see the drive because they know (or at least they think) the opportunities are gone. This appears to be a lot better argument than the argument that income mobility trumps income inequality. In fact, this kind of blows the former theory by showing there is nothing to trump. Hydra: "Maybe you don't see the drive because they know (or at least they think) the opportunities are gone." The opportunities for billionaires such as Michael Dell, Steve Jobs, Fred Smith¸ Herb Kelleher, Oprah Winfrey, Sergey Brin, Dustin Moskovitz, and George Lucas weren’t just sitting there waiting to be plucked. Every one of them created his or her own opportunity. Creating opportunity is what “drive” is all about. People with "drive" emerged from all economic periods in U.S. history - including the Great Depression. There's nothing special about today that prevents the creation of opportunity.
. Creating opportunity is what “drive” is all about. Agreed. But drive may not be the only input to the creation of opportunity. People with "drive" emerged from all economic periods in U.S. history -including the Great Depression. But suppose that you do not know everything, and there is something different. Like mass communication. Or population. Suppose huge masses just give up, because they have seen the results of hard work decimated. Pensions stolen, home values crashing, 401ks decimated, fraudulent help offered by sleazy foreclosure operators, two or three year job searches, etc. Etc. It is easy to say that human spirit can overcome any adversity, but when the boat is on fire and you need to step up to leave the cabin top, your options are very limited unless someone is there to help. No one would denigrate what Bill Gates did. He ordered a rudimentary computer and set about making programming it somewhat easier than flipping eight weighed and pushing a button. Had he come along five years sooner, that computer would not have been available. Five years later, and someone else would have beaten him to it. Also, lower income Americans likely captured a disproportionately larger share of the gains-in-trade from international trade, because lower-priced goods fell more (or rose less) than higher-priced goods. Total income from all people living in a particular household. Income refers not only to the salaries and benefits received but also to receipts from any personal business, investments, dividends and other income. Furthermore, household members do not need to be related to be part of a household. Income inequality is being driving of lower real wages and unemployment for blue collar workers. The use of Household Income hides the impact of that inequality. It includes supervisors and proprietor workers who have been less affected. Household Income masks the fact that today households include more than one job where older data have households with only one job. The blue collar workers have less income from investments, dividends and other income. Few blue collar workers have a benefit package as good as what they hade in the past yet it costs more. That increase in benefit cost is pure inflation adding no extra value. The divergent trends between falling wages and rising compensation in part reflects an increased cost of non-wage income, and in part reflects the growing wage gap between non-supervisory workers on the one hand and supervisors or proprietors on the other. As computer techs say garbage in garbage out. No mater how sophisticated the algorithm putting Household Income into an analysis of income inequality is going to give a garbage outcome. That chart does not tell about the facts as I know them to be today. If you graduated with an enginerring degree in the 70s-80's you could easily find a job and purchase a home. Plus state colleges were actually afforable. Today an engineering graduate has paid many times more for the same eduacation. And he will have less employment opportunites. And he will not be able to afford to purchase a home in many areas of this country. How many of you know a college graduate still living with his parents? population with the highest income exceeded the aftertax income of the remaining 80 percent. Yes, income inequality has increased significantly since the time of the Affluent Society, and is now sustained at a high level. Also, income inequality is much higher in the U.S. than in most other developed countries. 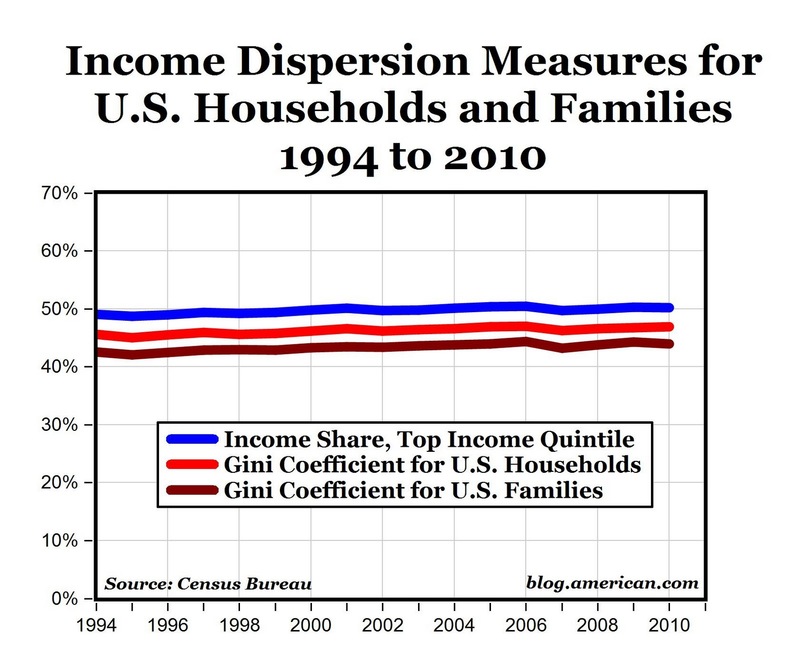 As James pointed out, household income now often includes two earners. All they got was lower quality junk - that's no improvement. That trade is what got them to that lower income status. That presumes opportunities exist and that everyone can create the ones that do not. Entreprenurialism is not the way for everyone, stop trying to shove it down everyone's throat. sethstorm: "Entreprenurialism is not the way for everyone, stop trying to shove it down everyone's throat." You're mistaken. Any able-bodied resident in the U.S. - and almost any disabled American - can create opportunity for himself. The biggest obstacle standing in his way is the negativism from those fools who continue to insist that today's economy is different and the opportunities are gone. Zachriel: "income inequality is much higher in the U.S. than in most other developed countries." And, not coincidentally, median household income in the U.S. has for many years been higher than in every other developed country. Income is not a fixed and limited good. The entrepreneurial billionaires of the U.S. have made all Americans wealthier. They got rich by providing value to the rest of us. Oh yeah! Life in the fifties and early sixties was just a hoot! Good times all around, eh? Gee! All that wealth wasted and for what? "If you graduated with an enginerring degree in the 70s-80's you could easily find a job and purchase a home." You still can. My wife speaks with a deep Colombian accent, her engineering degree is from a school in her native country. A few months ago, she easily lined up 4 interviews and received 4 excellent job offers. "Plus state colleges were actually afforable." So time to downsize the gold bricking, Marxist professors teaching phony subjects like Latin American studies. "That presumes opportunities exist and that everyone can create the ones that do not." ~Sethstorm, who declared awhile ago he is perfectly content to live on government programs for the rest of his life. "Yes, income inequality has increased significantly since the time of the Affluent Society, and is now sustained at a high level." Clearly, what we need is more Obamanomics. That will fix everything. "Household Income masks the fact that today households include more than one job where older data have households with only one job." I would like to see the numbers. I have a hunch smaller household sizes and wealth transfer payments offset a lot of the multiple earner argument. James: "Household Income masks the fact that today households include more than one job where older data have households with only one job." I think you are mistaken. In the 1950s when I grew up, almost every adult had a job. A large number of women had the same job: housewife. Their wages were zero. In today's economy, we are so wealthy that most families can now afford to pay wages for food preparation, house cleaning, child care, and other tasks formerly performed by those housewives. Talented and educated women are now free to work in what were once male-dominated occupations. Two earner households represent economic progress, James. juandos: And, not coincidentally, median household income in the U.S. has for many years been higher than in every other developed country. The U.S. had greater income equality during the 1950's and 1960's, and yet enjoyed a long period of economic expansion, so clearly the current levels of income inequality are not necessary for sustained economic growth. Some income inequality is certainly conducive to productivity, but too much can create unnecessary hardship and political instability. zachriel: "Some income inequality is certainly conducive to productivity, but too much can create unnecessary hardship and political instability." How? Why would anyone revolt when they are living in the nation with the world's highest standard of living? Again, the U.S. has long had much higher inequality than the rest of the developed world. It has also long had a higher standard of living. It is the opportunity for much higher economic rewards which drives entrepreneurs and the motivated to increase the standard of living for everyone. That the Occupy Wall Street "revolution" cannot articulte or even agree on goals is clear evidence that "political instability" in America has no legs. Jet Beagle: Again, the U.S. has long had much higher inequality than the rest of the developed world. Don Culo: "Plus state colleges were actually afforable." Over 1.6 million people in this nation found college education to be affordable in the most recent year for which data is available. Many decided that such education was worth the loans they had to take out. So clearly, college education in the U.S. is affordable. Were it not, the number of degrees granted would have decreased rather than increased. Did you even look at the data, Zachriel? Clue me in if I'm missing something. But it seems to me that we are comparing apples and oranges here. 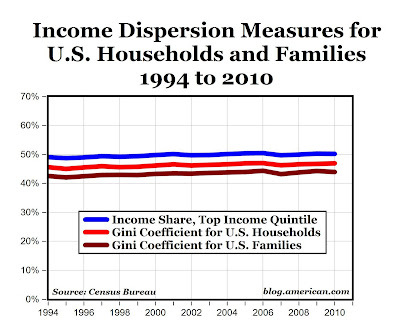 The graphs show income share, top income quintile, but not the middle or bottom quintiles. By comparing the Gini Coefficient for U.S. households and U.S. families with the top income quintile, isn't this misleading? Don't the Gini Coefficients include all households and families - including the top income quintile? This skews the results since so much of national income does go to the top quintile. If so, it's no wonder the graphs don't show much of an income inequality. The source is most likely to be the Census Bureau. I'm not contesting that, but it does seem that that the only data being selected was simply to prove a point, when other data available could easily disprove the point or at least raise doubts. This appears to be a mis-use of statistical data. Does anyone else see what I'm seeing? Also, income inequality is not something new. I recall this being discussed as long as twenty years or so ago, when the point was made that the income gap between those at the top of the American corporate world and those at the bottom, was much greater than other industrialized countries. b. the Gini coefficients should be increasing over time. But neither of those quantitative measures of income inequality are rising over time. That was the point I was trying to make. Jet Beagle: According to your source, the U.S. has had higher inequality than every other developed nation for the past three decades. Suppose it matters what you meant by "much" and "long". Most developed countries (excepting France) were about comparable at until about 1980, when inequality in the U.S. started increasing. Mark J. Perry: If income inequality is rising over time then: a. the share of income going to the 20% should be increasing over time, and b. the Gini coefficients should be increasing over time. That is incorrect, or rather, not necessarily true. The Gini Index is not an unambiguous measure, and it depends on the size of the subsets compared. If you use quintiles or deciles, it won't reveal much detail about the distriution of the top 1% or top 0.1%. That's why the Gini Index may not show an increase, while other statistics indicate that the top 1% and top 0.1% increased their share of the total income. In any case, a single variable can't represent all aspects of a distribution. 1. Age 25, scholarships and self-financed at a private university (parents provided partial living expenses), majors in English and German, lived at home 4 mos. after graduation before moving out, employed, currently has zero debt. 2. Age 23, scholarships and self-financed at public university (parents provided partial living expenses), music major, currently in grad school, has lived on own all but two months since H.S. graduation, employed, less than $8K debt. 3. Age 20, scholarships and self-financed at public university (parents provided partial living expenses), music major, has lived on own after first semester, employed, less than $5K debt. Bottom line: not all 20-somethings believe they should have everything, some work hard, and choices definitely do matter. Each of the three are definitely low-income now; each has good opportunity to improve, especially if the government will allow the economy to grow.